Oh, ok, so maybe I’m dorky, but I’m always thrilled when someone buys something of mine. It makes me feel warm and special and happy. 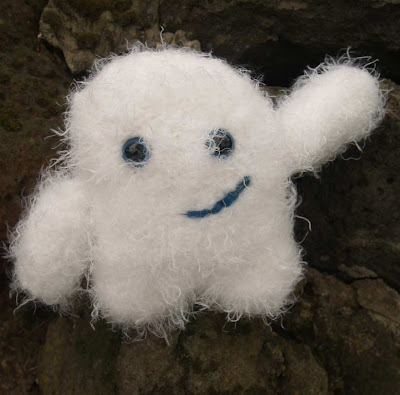 And I’m telling you this because someone just bought my baby Yeti off Etsy! When I first started on Etsy, I had two sales pretty quickly and then it got very quiet, for quite a saddening length of time. I don’t really pimp it around much, there’s links here and on my website but that’s about it. I know some people promote the hell out of their etsy’s, but I don’t have the time. The saying Jack of all trades, master of none is pretty accurate, I’m so busy doing everything I do that I don’t have heaps of time to follow through with as much background work on them as I’d like. Recently I decided that what goes around comes around and since I had a bit of spare money, I went on a little buying spree. I bought a number of things of etsy, mostly from fellow Dust members (Down Under Street Team, the Australian sellers club) and bought a number of things from ebay and stores, sharing the love (and my little bonus) around. I did it for two reasons. One was that when I have, I like to share, so that others can share in my good fortunes, and also I figured that on a karmic level, no one would be buying my items if I wasn’t buying anyone elses. And it’s paid off! In a week I’ve had two etsy sales. Firstly the top hat and now the baby yeti!